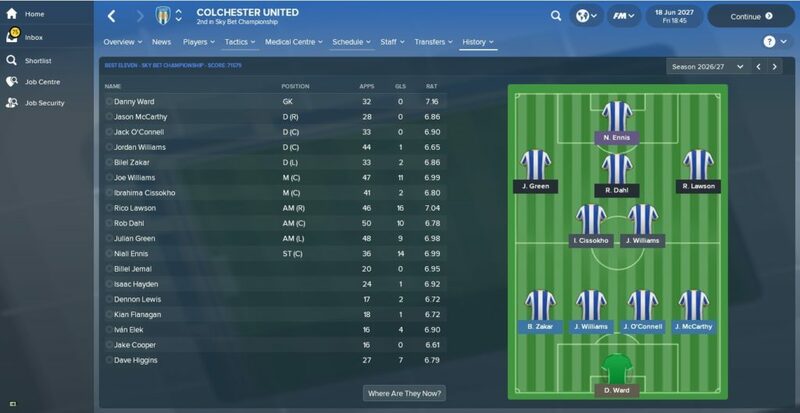 In part one of the League Two ‘sugar daddy’ experiment, Coventry City and Colchester United had made the most progress since being handed a bumper cash injection at the start of the 2017-18 season on FM18. Those two clubs were living the high life in the top half of the Championship having enjoyed two promotions in four years (two in Coventry’s case) thanks to smart recruitment on and off the pitch. 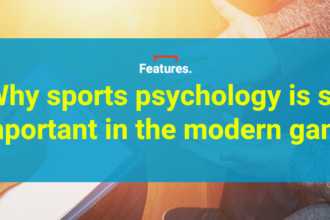 While they were the standout success stories, others such as Cambridge United, Stevenage and Chesterfield, had also made large strides, consolidating themselves as mainstays in League One. All 24 of the teams had football league status after five years which suggested that the presence of a ‘sugar daddy’ running the club had a generally positive effect across the board. However, five years wasn’t a huge amount of time to gauge how successful or otherwise the 24 League Two clubs had been when it came to spending their new-found wealth. A decade would, though, be sufficient in demonstrating whether or not a club’s spending on players, staff, facilities and everything else, had been done effectively over a long period of time. Here’s how things looked at the end of the 2026-27 season. Colchester in the Premier League! Colchester clinched promotion to the Premier League on the final day of the 2026-27 season. Colchester’s ambition to make the most of their sugar daddy status was confirmed at the very start as they somehow persuaded a virtually retired Lucio to put down his Caipirinha’s and relocate to Essex for a year. While Lucio’s head-turning signing was a one-off, Colchester proved themselves to be an ambitious club in other ways by improving themselves on a year by year basis. They were promoted from League Two in 2018-19 after losing the play-off final the season before, won the League One title in their second season at that level and never finished below 12th in the Championship. Colchester’s best XI in their Premier League promotion-winning season. John McGreal, Gary Bowyer and Tim Sherwood (gilet and all, presumably) played significant roles in Colchester’s rise but it was Paul Heckingbottom who took them one step further and into the Premier League. Bravo, sir. They spent a fair amount to get there but Canadian midfielder Stephen Eustaquio (remarkably not a regen) was their club-record signing at just £7.75m which is a relative pittance now let alone in ten years time. Ultimately, savvy player signings and astute managerial appointments ensured that Colchester went further than any other League Two club over a period of ten years. Slightly surprisingly only four clubs including the mighty U’s had made their way from League Two and into the Championship by the start of 2026-27 season. Coventry City were well established in the second-tier by that point with 2026-27 marking their seventh successive season in the competition, although Mark Hughes and Joe Allen had long since left. Their squad in the final year was a who’s who of current up-and-coming English talent with Ben Chilwell, Will Hughes, Kasey Palmer, Sheyi Ojo and Tammy Abraham, all on the wage bill at the Ricoh. Tammy Abraham inexplicably wearing the no.6 shirt at Coventry City in 2027. 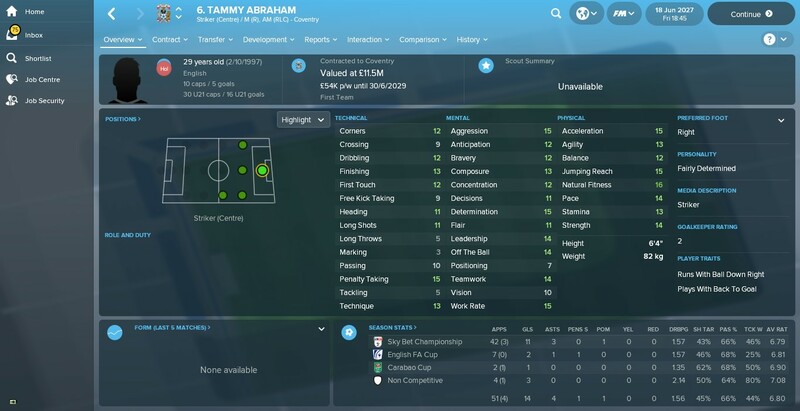 Unfortunately, that quintet alongside others such as a Steven Taylor regen, were unable to do much that season, finishing well off the pace in 13th position, although they did reach the FA Cup semi-final. Faring slightly better than the Sky Blues were Cambridge United, who after avoiding relegation by the skin of their teeth the previous season, managed a respectable 11th place finish. 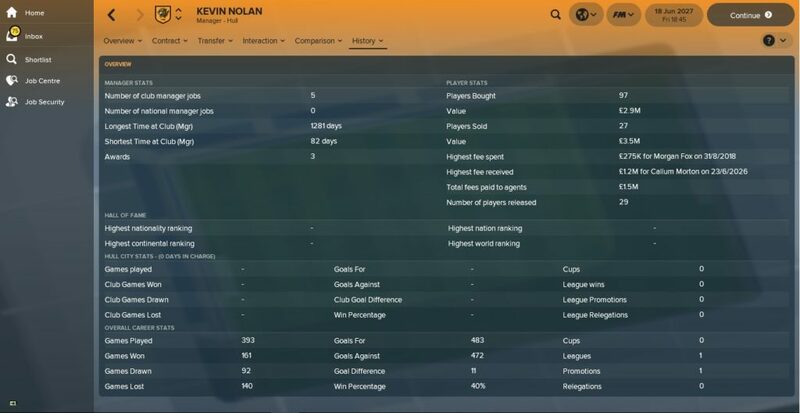 As is often the case, though, Cambridge were a victim of their own success as Kevin Nolan was poached by Hull at the end of the season following an impressive four-year spell in charge. Big Sam would’ve been proud of his former charge’s accomplishments, we’re sure. You can tell he’s an Allardyce disciple by that win percentage alone. The only other club to start the sim in League Two and end it in the Championship were Stevenage but frankly the less said about them the better as they ended rock-bottom of the pile, 13 points from safety. Managerial upheaval certainly didn’t help as Steve Morison, Jem Karacan and Paul Butler all tried their hand at improving results to no avail. Accrington Stanley was one of 12 clubs to take part in the inaugural English football league season way back in 1888-89 but pretty much since then, they’ve been consigned to lower or even non-league football. 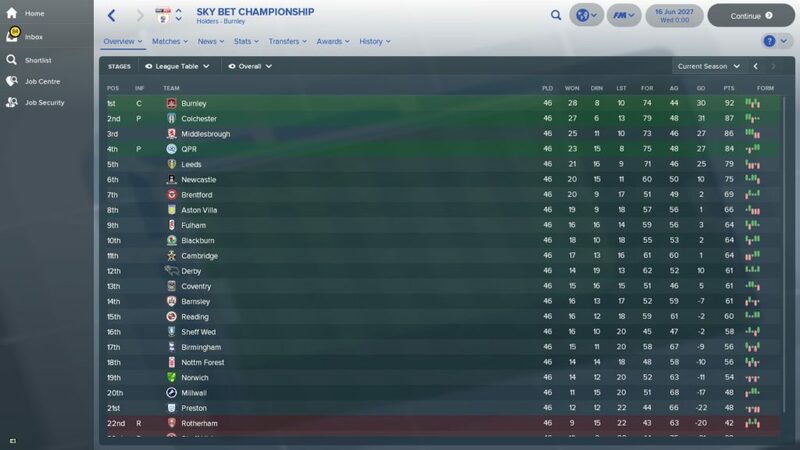 On this simulation, they hadn’t achieved much at all, spending three seasons in the Vanarama National between 2019-2022 but by the end of 2026-27, they secured promotion to the Championship via the play-offs, beating Lee Bowyer’s Bristol City at Wembley. 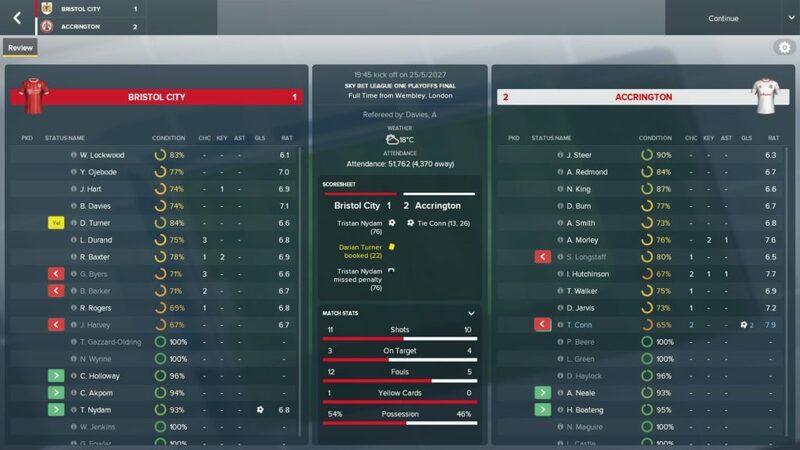 A play-off final double from regen Tie Conn sent Accrington into the Championship at Bristol City’s expense. Chesterfield spent the 2024-25 season in the Championship and went close to a second promotion in three years but found Bristol City too tough a nut to crack in the semi-finals. Notts County and Swindon also performed well, ending up in 7th and 8th respectively, while Swindon, Lincoln, Crawley, Forest Green and Exeter, all comfortably avoided relegation. The same could not be said of Carlisle, Grimsby and Newport, however, as they suffered relegation to the bottom rung of the football league. While three former League Two clubs were relegated from League One at the end of 2026-27, three more would replace them the following season. Crewe Alexandra clinched the title with a relatively small points tally of 81 and were joined in the automatic places by Barnet who by then had been taken over by a wealthy Kuwaiti consortium. 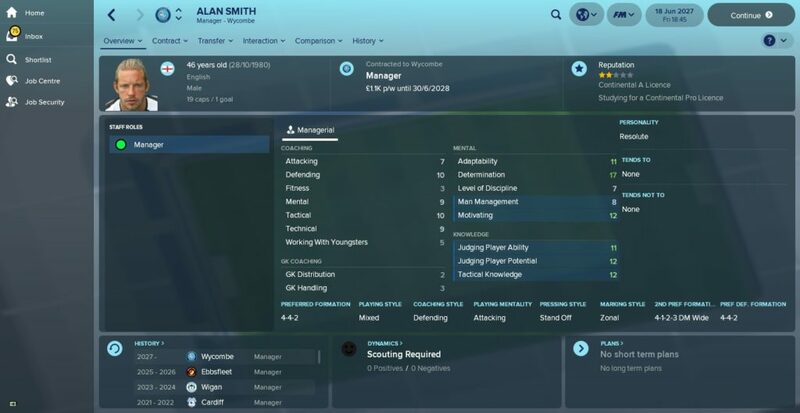 After a 15-year stay in League Two, Alan Smith was the man to take Wycombe up a level. Wycombe, managed by ex-Leeds forward turned Man United spoiler, Alan Smith, went up via the play-offs after beating Cheltenham 2-1 with current Brighton winger Solly March turning in a man of the match performance. Lads, what on earth happened? We gave you a sugar daddy and £20m in the bank for goodness sake, where did it all go wrong?! Yeovil’s plight over the decade really was something to behold. No club oscillated between divisions quite as wildly as the Glovers and they were the only club languishing outside the football league by the end of the save. 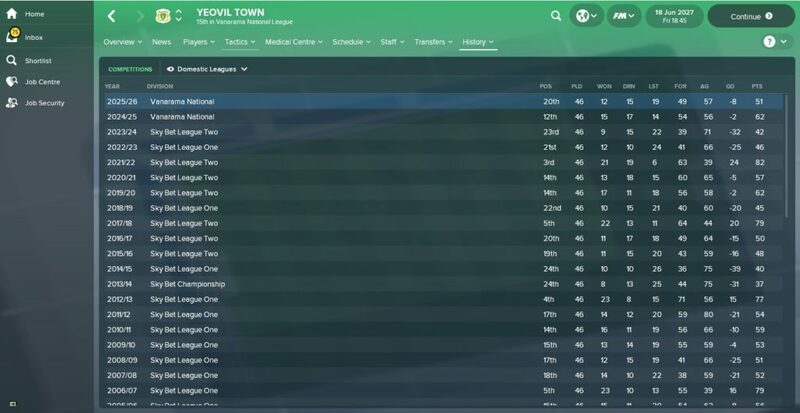 Over the course of ten years, Yeovil achieved two promotions from League Two to League One and endured three relegations, two the opposite way and another down to the Vanarama National League. What a mess. So there you have it, ten years after giving each and every League Two club the same bank balance, Colchester United ended up in the Premier League, Yeovil sat some four divisions below them and the rest were scattered somewhere in between. As is so often the case in football, money it seems offers no absolute guarantee of success.